Action Mental Health has been working with individuals with mental health needs for 50 years, and providing them with the support needed in their recovery. 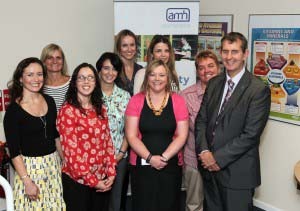 Health Minister, Edwin Poots has officially opened the AMH New Horizons service in Belfast City Centre’s Fisherwick Building. Action Mental Health Chief executive David Babington said, “AMH New Horizons helps people to overcome the effects of mental ill health and in many cases return to work. We offer a range of recognised qualifications and provide training, personal development programmes and social and recreational activities. The Belfast service’s re-location from Duncrue Industrial Estate to the city centre, enables us to attract clients from all over Belfast, it also gives us the opportunity to promote AMH in a prime city centre location and already we have seen an increase in enquires. The new location has helped us to source more appropriate training placements and employment opportunities for our clients”. 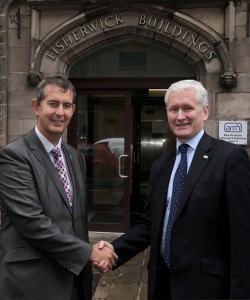 The Minister met with staff and clients and was given a tour of the newly refurbished training facilities. Speaking at the official opening, the Minister said: “This new facility with the latest equipment is a credit to AMH and its enthusiasm to make life better for those with mental health problems. “Training for any individual seeking work is crucial and it is no less essential for people who have had mental health problems.